even a few steps can look like this. When you have COPD, even a few steps can look like this. COMBIVENT RESPIMAT may help you breathe better. Are you new to COMBIVENT RESPIMAT? Are you already taking COMBIVENT RESPIMAT? 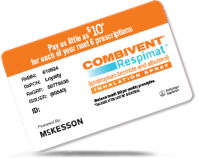 COMBIVENT RESPIMAT (ipratropium bromide and albuterol) is indicated for use in patients with chronic obstructive pulmonary disease (COPD) on a regular aerosol bronchodilator who continue to have evidence of bronchospasm (airway narrowing) and who require a second bronchodilator. Do not use COMBIVENT RESPIMAT if you are allergic to any of the ingredients in COMBIVENT RESPIMAT or to atropine or other similar drugs. COMBIVENT RESPIMAT can cause the narrowing of the airways to get worse (paradoxical bronchospasm) which may be life threatening. If this happens, stop taking COMBIVENT RESPIMAT at once and call your doctor or get emergency help. COMBIVENT RESPIMAT can cause serious heart-related side effects, such as palpitations, chest pain, rapid heart rate, high blood pressure, tremor, or nervousness. Call your doctor if you experience any of these symptoms. Avoid spraying COMBIVENT RESPIMAT into your eyes. COMBIVENT RESPIMAT may increase eye pressure which may cause or worsen some types of glaucoma. If you have sudden vision changes, eye pain or visual halos, stop taking COMBIVENT RESPIMAT and call your doctor right away. COMBIVENT RESPIMAT may cause difficulty with urination. Dizziness and blurred vision may occur with COMBIVENT RESPIMAT. Should you experience these symptoms, use caution when engaging in activities such as driving a car or operating appliances or other machines. Do not use COMBIVENT RESPIMAT more often than your doctor has directed. Deaths have been reported with similar inhaled medicines in asthma patients who use the medicine too much. Seek medical attention if your treatment with COMBIVENT RESPIMAT becomes less effective for symptomatic relief, your symptoms become worse, and/or you need to use the product more frequently than usual. Allergic reactions may occur, including itching, swelling of the face, lips, tongue, or throat (involving difficulty in breathing or swallowing), rash, hives, bronchospasm (airway narrowing), or anaphylaxis. Some of these may be serious. If you experience any of these symptoms, stop taking COMBIVENT RESPIMAT at once and call your doctor or get emergency help. Tell your doctor about all your medical conditions, especially if you have narrow-angle glaucoma, prostate or urinary problems, a history of heart conditions (such as irregular heartbeat, high blood pressure), thyroid disorder, or diabetes. Also tell your doctor if you are pregnant or nursing. Tell your doctor about all medicines you are taking, especially heart medications or drugs to treat depression. The most common side effects reported with use of COMBIVENT RESPIMAT include infection of the ears, nose, and throat, runny nose, cough, bronchitis, headache, and shortness of breath. Click here for full Prescribing Information and Patient Instructions for Use. This information is for U.S. residents only. Products discussed herein may have different labeling in different countries. Eligible commercially insured patients 18 years or older may pay as little as $10/month with a maximum savings up to $50/monthly prescription for up to 6 prescriptions per calendar year. Benefits not to exceed program expiration on 12/31/2020. If you live in Massachusetts, card expires on the earlier of June 30, 2019, or date AB-rated generic equivalent is available. One card per patient, not transferable, and cannot be combined with any other offer. Card not accepted in Veteran’s Affairs pharmacies. Program not health insurance. You must present this card to the pharmacist with your Combivent Respimat prescription to participate. Only valid for commercially insured patients in the 50 United States, territories, DC, and Puerto Rico. Not eligible if prescriptions are paid for in part/full by state or federally funded program(s), like Medicare Part D, Medicaid, Veteran’s Affairs, Dept. of Def., or TRICARE and where prohibited by law. Offer may change at any time, without notice.